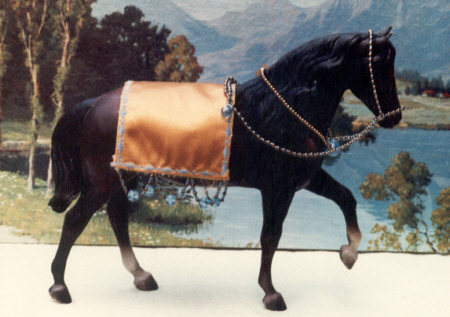 Melody D. Snow has been collecting model horses since before she could remember. 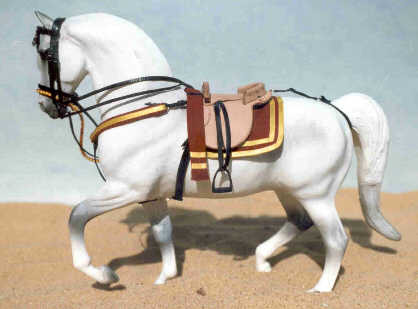 Her first model was Breyer's Bay Running Mare. "My mom bought the mare for my grandfather. He didn't like it. However, I did!" When Snow grew older, a family friend gave her a box of costume jewelry. This was obviously perfect for putting on model horses. With help from her grandmother, Snow made simple play sets out of beads, yarn, and satin. In 1980, Just About Horses, the Breyer Animal Creations company newsletter, began offering free classified ads in their magazine. Snow's mother encouraged her to place an ad in the first issue featuring the classifieds (Volume 6, No. 1) . That was the beginning of Melody's Tack. Snow was only 14 years old. Melody's Tack operated independently for a few years before being merged with her mother's corporation, Tender Loving Care Nursing and Related Services, Inc. When Snow got married Melody's Tack was officially dissolved and The Unicorn Woman was founded as a sole proprietorship. The name change indicated a new direction for the artist's efforts. Instead of focusing on play sets, Snow now concentrated on detailed miniature reproductions suitable for Live Showing. Snow researches her products extensively and is constantly looking for new techniques to improve her products. She is a member of the Lone Star Leather Crafters Guild and has competed in the International Federation of Leather Guilds Show, which is held each year by a participating leather guild. Her work has been on display at the National Cowgirl Museum & Hall of Fame as part of their leathercraft display held in conjuction with Lone Star Leather Crafter's Guild. Snow teaches others about tackmaking. She has conducted seminars, workshops, and demonstrations at such events as Lone Star Live, Breyerfest, and the Fort Worth Stock Show. She writes tack articles for various magazines and she has a growing line of kits available through her website. Melody D. Snow is also a freelance writer with over 180 published works to her credit. While her writing career seriously began in 1989, she has been telling/writing stories since a child. Snow recalls, "Before I could read, I'd tell myself stories while holding a book. This was very hard on the chosen book. I'd get so involved in the story that I would forget to turn the pages. I held the pages open with my thumb near the spine and this wore holes in the first few pages!" Her real break into publishing occurred when Snow received the premier issue of The Hobby Horse News. The magazine desperately needed columnists, so she pitched a book review column that dealt with the interests of the model horse hobbyist. The editor liked it and Snow wrote for THHN until the magazine ceased publication in 2004. From a THHN regular columnist, Melody Snow has expanded to freelance articles in several national magazines, such as Just About Horses, Leather Crafters & Saddlers Journal, and Adventist Review. Much of her writing is based on her nearly 30 years experience as a model horse saddler/tackmaker. Several longer projects, including completed science fiction and fantasy novels, are "in the files".